Note. 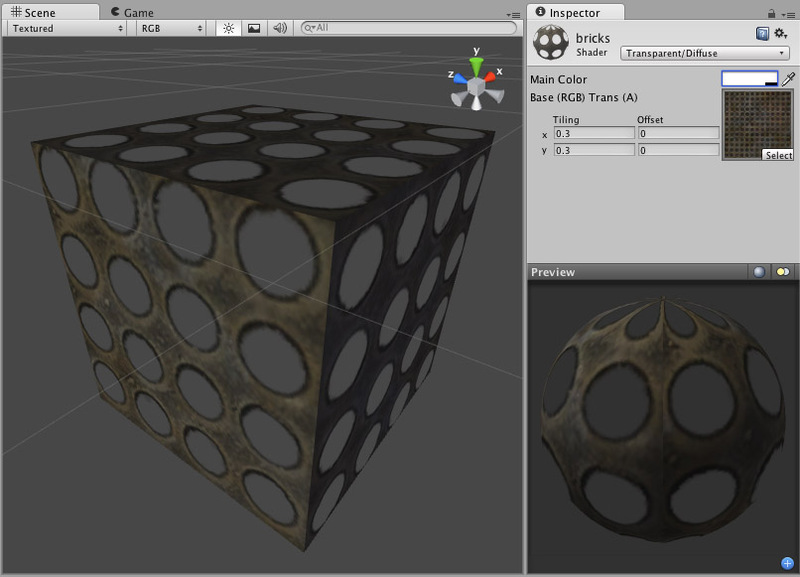 Unity 5 introduced the Standard Shader which replaces this shader. See in Glossary geometry partially or fully transparent by reading the alpha channel of the main texture. In the alpha, 0 (black) is completely transparent while 255 (white) is completely opaque. If your main texture does not have an alpha channel, the object will appear completely opaque. Using transparent objects in your game can be tricky, as there are traditional graphical programming problems that can present sorting issues in your game. For example, if you see odd results when looking through two windows at once, you’re experiencing the classical problem with using transparency. The general rule is to be aware that there are some cases in which one transparent object may be drawn in front of another in an unusual way, especially if the objects are intersecting, enclose each other or are of very different sizes. For this reason, you should use transparent objects if you need them, and try not to let them become excessive. You should also make your designer(s) aware that such sorting problems can occur, and have them prepare to change some design to work around these issues. See in Glossary moves or rotates around. Generally, this shader is cheap to render. For more details, please view the Shader Peformance page.